We’re a little bit pass the halfway point of summer, but there’s still plenty of time to hit the road for some weekend trips. If you’re a weekend warrior that doesn’t mind doing some time on the road driving to a destination, the iBolt xProDock is one driving companion that you might actually find useful. 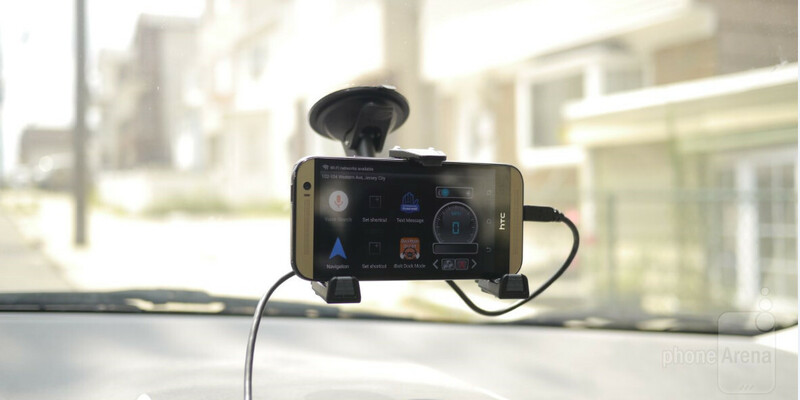 Naturally, there are plenty of smartphone docks for the car out there, but iBolt’s offering extends itself by giving users the added benefit of its accompanying Dock’n Drive app. Okay, there’s nothing much to say about the iBolt xProDock’s design because it looks much like any other dash or windshield mounted dock out there. Using the adjustable clasp, it holds our HTC One M8 on its sides firmly. Clearly, though, it’s meant to be used primarily in landscape – as the portrait orientation looks a bit more offset. Nevertheless, it’s able to accommodate the biggest of handsets, even those that are stuffed into brick-sized cases. What’s pleasantly surprising about it is the “stick anywhere” material of its suction cup, which retains its sticky texture after multiple applications – so it can be attached to a variety of flat surfaces without losing suction. The second part to the iBolt xProDock is the accompanying Dock’n Drive app that owners of Android smartphones can download for free. Sorry iPhone owners, you’re out of luck with this one – albeit, you can still use it as a regular dock. Included with the packaging is the Dock’n Drive NFC tag, which allows us to instantly launch the app as soon as our NFC-enabled smartphone comes into contact with it. To tell you the truth, we would’ve preferred the NFC tag incorporated into the actual unit, as opposed to being a separate thing. As for the Dock’n Drive app itself, it is mainly comprised out of shortcuts to various functions. For the most part, the digital speedometer and compass are big enough in size to make out from our seat. In keeping us drivers from being distracted, the app also provides us with options to disable certain things – like receiving text messages, disabling the screen timeout, hiding the notification bar, and much more. Even though it’s not something offered by the app directly, we can use our phone’s video recorder to turn the entire thing into a neat dash cam. Lastly, the iBolt xProDock features an integrated microUSB cable to give drivers the option to charge their devices. Priced at $39.95 online, it’s a little bit much for just a standalone dock for the car, but then again, there’s more functionality thrown in with the Dock’n Dive app. However, we have to point out that the app is free, which means that any phone can download it – so who knows how that’s factored into its MSRP.